UAE Number 1 Plate Sells For £3.4 Million! A personalised registration plate bearing just the number one fetched AED18m (£3.4m) at auction in the UAE. His bid was 18 times the reserve price but is not the highest sum that has been paid for a number plate in the UAE. 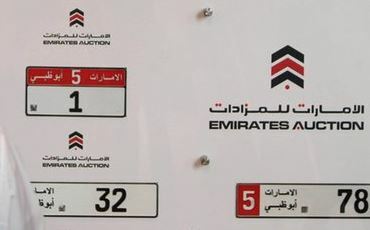 In 2008, the number one plate of the richest of the UAE’s seven emirates, Abu Dhabi, sold for AED52.2m at auction. Zarouni’s plate is for Sharjah, the third-richest emirate. The auction made a total of AED50m.